Bella OS was a beginner-friendly Linux distribution based on Xubuntu's latest LTS (long-term support) release and featuring a customised Xfce desktop. The project's primary goal was to provide a curated suite of high-quality web, office and entertainment applications on top of a desktop that combines some of the best features from several popular operating systems. 2013-05-06 NEW • Distribution Release: OS4 13.4 "KDE"
Rate this project Roberto Dohnert has announced the release of a "KDE" edition of OS4 13.4, a desktop Linux distribution with KDE 4.10.2, based on Ubuntu's latest long-term support release (version 12.04): "Today we released the KDE release of OS4 OpenDesktop 13.4. With this we bring you the very best the K Desktop Environment offers along with the ease of use that people have come to expect with OS4 OpenDesktop. This release includes: all core updates to the OS4 OpenDesktop 13.4 release; KDE 4.10; Calligra as the default office suite, LibreOffice 4.0 is available in the repositories; Muon software center; Synaptic; GDebi KDE; Firefox 20; Thunderbird with the Lightening extension; Clementine music player; VLC. 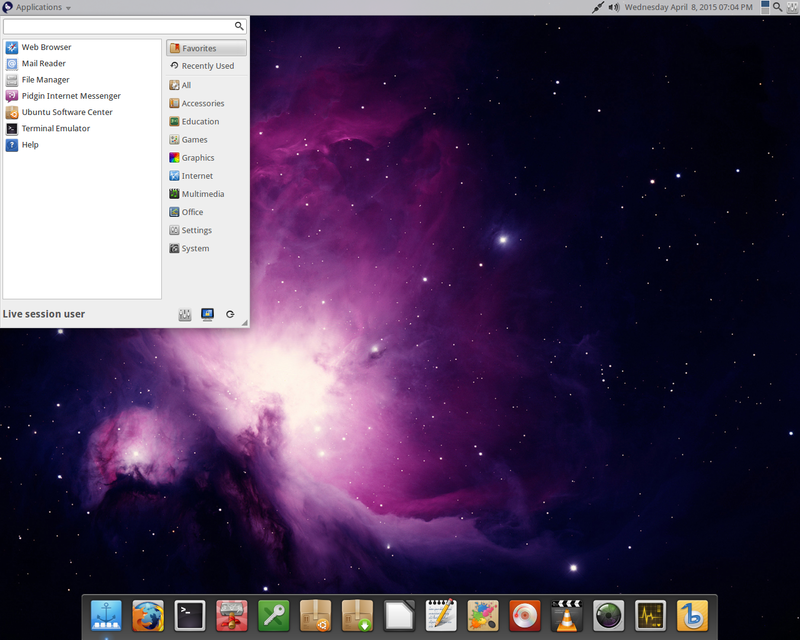 We are very happy to add the KDE desktop to our line-up of desktops that we support. If you have any questions or comments, don't hesitate to ask us." Here is the brief release announcement. Download from SourceForge: os4-13-4-64.iso (1,559MB, MD5). Black Lab Linux is an Ubuntu-based distribution which is currently available in two editions, Core and Desktop. Core is intended for use in low resource computing, server environments and embedded systems while Desktop features lots of applications for end users. The developers have announced the release of Black Lab enterprise Linux 11.5: "Today the PC/OpenSystems Open Source development team is pleased to announce the public release of Black Lab Enterprise Linux 11.5, the latest development of our open source project. We have made several enhancements which benefit both new users or veterans upgrading from our last release, or the one before that. Black Lab Enterprise Linux is a an excellent drop-in replacement for Windows, macOS or other distributions of Linux. BLEL 11.5 is distributed in two flavors, Desktop and Core. The first is full featured, offering everything users need : productivity software, games, software development tools, cloud and business applications. It's optimized for general everyday desktop use. Core is designed for embedded systems, IoT devices and users who want to build their own systems from the ground up." Further information can be found in the distribution's release announcement. Download (pkglist): bll-115-x64.iso (1,739MB, SHA256, torrent), bll-core-115-x64.iso (1,447MB, SHA256). Black Lab Linux is an Ubuntu-based distribution which develops a user-friendly, commercial distribution. The Black Lab team is currently working on the upcoming release of Black Lab Enterprise Linux 11.5 and have published a development snapshot. The new beta updates several packages, including the Linux kernel, LibreOffice and the Ice Single Site Browser. "Today we are pleased to announce the first public beta release of Black Lab Enterprise Linux 11.5. With this release we have made several enhancements to the Black Lab Enterprise Linux system. We have increased driver capabilities with the inclusion of a new kernel and we now have better performance. We have also worked on web app capability and with the Chromium Web Browser you now have the same functionality as Chrome OS as well as the ability to use standard Linux applications." Further information, a screen shot and a list of key package updates can be found in the distribution's release announcement for 11.5 Beta 3. Download: bll-115-beta3-x64.iso (1,860MB, SHA256, pkglist). The Black Lab Linux team has announced the availability of a minor upgrade to the distribution's 11.x series. The new release, Black Lab Enterprise Linux 11.0.3, ships with version 4.10 of the Linux kernel, LibreOffice 5.4, Google Chrome 60 and Samba 4. "While our official builds are based on the GNOME desktop with the exception of Black Lab Embedded Linux, which is based on LXDE, we do offer desktop spins for users. that include KDE Plasma 5, Xfce, LXDE and MATE. Black Lab Enterprise Linux focuses on the following changes: Linux kernel 4.10; Google Chrome 60; Thunderbird 52.3; LibreOffice 5.4; Webmin 1.8; ksplice for rebootless kernel updates; Samba 4; OpenLDAP; Container support; web container support; support for the XFS, JFS and Btrfs file systems for installation targets." The distribution is available in many editions and spins, providing a range of desktop environments, including GNOME, LXDE, MATE Plasma and Xfce. The official images include the following editions: Enterprise, Education, Embedded and Studio. A detailed list of features and the available spins can be found in the distribution's release announcement. Download (pkglist): bll-1103-ent-x64.iso (1,690MB, SHA256), bll-1103-edu-x64.iso (2,259MB, SHA256), bll-embedded-1103-x64.iso (999MB, MD5), (2,664MB, SHA256). Black Lab Linux is a commercial distribution based on Ubuntu. The Black Lab team has announced the availability of Black Lab Enterprise Linux 11. The new release features editions with the GNOME or Xfce desktop environments, version 4.8 of the Linux kernel, Skype and support for Flatpak packages. "This is a milestone release for PC/OpenSystems LLC. Black Lab Enterprise Linux 11 balances cutting-edge performance with the most stable GNOME desktop experience available. There are four versions tailored to the enterprise, educational sector and studio professional. IoT (Internet Of Things) is a core operating system experience built around the Xfce desktop environment for embedded, single-board systems and low-resource systems provided by Intel. Features: Linux kernel 4.8 LTS, Flatpak package management, LibreOffice 5.3, Google Chrome 58...." Further information, support options and download links for the four editions of Black Lab Linux can be found in the company's release announcement. Download (pkglist): bll-ent-11-x86_64.iso (1,558MB, MD5), bll-edu-11-x86_64.iso (2,229MB, MD5), bll-11-studio-x86_64.iso (2,596MB, MD5), bll-11-iot-x86_64.iso (1,448MB, MD5). Black Lab Linux is a desktop operating system based on software provided by Ubuntu packages. The Black Lab Linux project has announced the availability of a new version, Black Lab Linux 8.0. "Today our development team is pleased to announce the release of Black Lab Linux 8.0, the consumer version of PC/OpenSystems LLC's flagship distro and a culmination of over a year's worth of work. This Black Lab release moves from the previous 14.04 LTS base to the newer 16.04 LTS base. A major difference in this version is in the inclusion of available desktop environments. Currently, we are the only major Linux distributor outside of Ubuntu that ships Unity as an option. In addition: the KDE Plasma 5 desktop, LXDE for older/legacy hardware, GNOME 3.18. Xfce is included on the GNOME ISO and GNOME Flashback session is available within Unity." Further details and a list of supported features can be found in the project's release announcement and see also the combined package list of the five editions. Black Lab Linux 8.0 is a commercial distribution and purchase links are available through the release announcement. The Black Lab Linux team has announced the launch of a service pack update to the project's enterprise product line. The updated release, Black Lab Enterprise Linux 8 Service Pack 1, is a commercial release and uses software available in the Ubuntu LTS repositories. Black Lab Enterprise 8 offers the ability to boot on UEFI-enabled computers and will be supported through to the year 2021. This version of Black Lab offers the ability to work with Snap packages as well as traditional Deb packages. "Today the Black Lab Linux Development team is pleased to announce the release of Black Lab Enterprise Linux 8.0 SP1. Service Pack 1 is jam packed full of new innovations and features. Black Lab Enterprise Linux is the fastest growing Enterprise desktop Linux offering on the market today. Black Lab Enterprise Linux 8.0 SP1 is a hybrid operating system meaning you can deploy local applications that you need as well as the cloud based applications that you want." The release announcement has further details and purchasing options (pkglist). 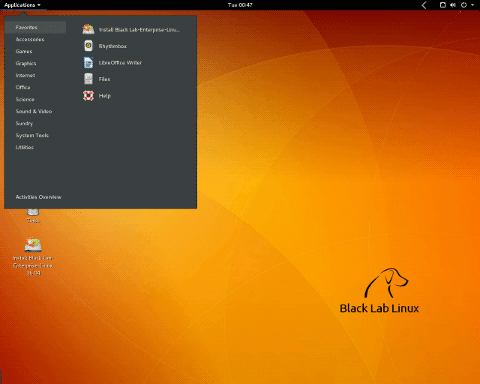 Black Lab Linux is a desktop distribution based on Ubuntu. The developers of the project have announced a new testing release, Black Lab Linux 8 beta 3. The new beta shifts the distribution's base from Ubuntu 14.04 to 16.04 and features three desktop flavours: GNOME, LXDE and MATE. "The development team is pleased to announce the new Beta release of Black Lab Linux 8 - our latest OS offering to bring the best Linux desktop distribution currently on the market. This release moves the kernel and application set away from the prior LTS 14.04 base to the new 16.04 LTS base. Black Lab Linux 8 will showcase 3 desktop environments : MATE, LXDE and GNOME 3." The release announcement includes a list of package updates and features. The announcement also mentions a few known issues, such as the installation process stalling when the computer has an active network connection. Download (pkglist): bll-8-x86_64-lxde.iso (1,141MB, MD5), bll-8b3-x86_64-MATE.iso (1,430MB, MD5), bll-8b3-x86_64-GNOME.iso (1,318MB, MD5). The Black Lab Linux team has announced the release of a new development snapshot. The new version, Black Lab Linux 8.0 Alpha 4, features a shift in focus toward cloud services. "Alpha 4 introduces several changes to the way Black Lab Linux is structured - it's no longer a one-size-fits-all distribution. The development team has changed the focus of Black Lab Linux 8 toward the cloud - meaning that all primary applications are web-based, full featured, apps. These are complemented with best-of-breed desktop applications installed locally, and you can add any-and-all Debian / Ubuntu packages to the default lineup. While the new alpha features several native desktop applications such as Chromium 50, Steam, Transmission and the VLC media player, web-based apps such as Google Office, Google Play, Twitter, Facebook Messenger and Outlook mail are also included. All the details can be found in the distribution's release announcement. Download: onyx-a4-x86_64.iso (1,654MB, MD5, pkglist). The Black Lab Linux team has announced the release of Black Lab Linux 7.6, a new update to the distribution's long term support series which will receive security updates through to the year 2019. The new release features UEFI support (in the 64-bit build) and version 3.19 of the Linux kernel. "Today we are releasing Black Lab Linux 7.6. Black Lab Linux 7.6 is the latest release of our stable 7.x series of OS's. Black Lab Linux 7.6 is supported long term until April 2019. What's new? There are a lot of changes to Black Lab Linux 7.6 some of which include: Linux Kernel 3.19.0-58, LibreOffice 5.1.2, Firefox 45.0.2, Thunderbird 38.6.0, Gmusicbrowser, GNOME Documents, Tracker fast search, HexChat IRC client, Xfce 4.12 enhancements, Skippy XD Expose style task switcher, Spotify, Steam game client..." Additional information can be found in the distribution's release announcement. Download: bll-76-x86_64.iso (2,385MB, MD5, pkglist).